Photo: Gwynne-Love House, ca. 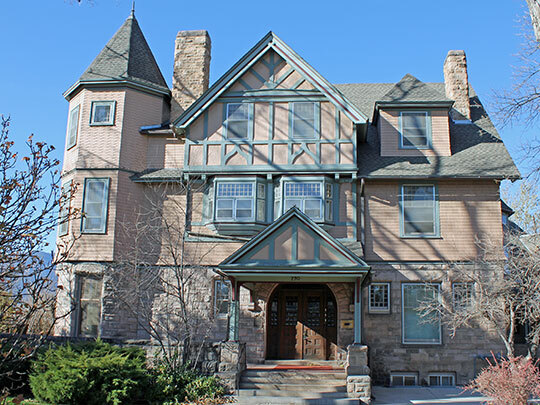 1886, 730 North Cascade Avenue, Colorado Springs, CO. Listed on the National Register of Historic Places in 1987. Photographed by User:Jeffrey Beall (own work), 2011, [cc-by-3.0 (creativecommons.org/licenses/by/3.0)], via Wikimedia Commons, accessed December, 2013. The El Paso County Courthouse is located at 27 East Vermijo Avenue, Colorado Springs, CO 80903; phone: 719-520-7276. El Paso County was one of the original 17 counties of Colorado Territory, defined in 1861. The name is Spanish, meaning The Pass, referring to Ute Pass north of Pike's Peak. The county is wooded in the western part. Being on the Divide, it is watered by creeks that are tributaries of both the Arkansas and the Platte. The largest of these streams is the Fontaine Qui Bouille or Fountain Creek, emptying into the Arkansas. El Paso County is bounded on the south by Pueblo County, on the east by Lincoln and Elbert Counties, on the north by Elbert and Douglas Counties, and on the west by Teller and Fremont Counties. The surface consists of rolling plains in the eastern part and of mountains in the western part. The area is 2,134 square miles, of which 4 per cent., or 62,408 acres, were under cultivation in 1900; the cultivated area in 1909 was estimated to be 100,000 acres, mostly without irrigation. The mean annual rainfall is 15 inches, and the average temperature from 45° to 50°. The county had 31,602 inhabitants in 1900; the population in 1910 was 43,321.